Home » Interesting Discussions » Your Say: Do you apply lipbalm everyday? Your Say: Do you apply lipbalm everyday? I had a case of dry lip the other day at the office, and while rummaging through my makeup pouch, realized I had no lipbalm on me. I should not have been surprised really. I hardly ever use lipbalm but I used to have a stick kept in there for emergencies. I eventually made do with a Dior Serum de Rouge lipstick (helped remoisten lips – amazing stuff!) and I could not help sharing that observation on the MWS Facebook page. A reader then asked if I used lipbalm everyday to which my answer was no. I probably belong in the minority but my use of lipbalm or any lip treatment is only at night before bed. That’s when I slather on Lucas’ Papaw Ointment or a lipbalm like MyLipStuff to protect my lips from the drying effects of the air-conditioner. In the day, I don’t have balm on. I know tinted lipbalm is quite the rage, but I have this thing against tinted lipbalm. When I used to use tinted lipbalm (I loved the one from LipIce) I found that I’d have to reapply and with every layer you put on, the colour gets brighter and brighter and it was always an unattractive fuchsia. Since then, I’ve steered clear of tinted balms. Not to say I won’t try them. They just aren’t a preference. I don’t even use balm under my lipsticks, or if I do, its rarely. If its a drying lipstick, I just don’t use it. Its just one of those things that are a personal preference. Your say: Do you apply lipbalm everyday? And if you do, what’s your lipbalm of choice? I used to have horribly dry, cracked lips until I discovered Lanolips during my Aussie trip last year. It’s great stuff! Now, I just use the colourless one at night. A little dab goes a long way and it works better than Lucas Pawpaw on me. I have loads of stick lipbalms too and use them during the day. My current faves are the Mojitate Kajitsu and Hada Labo ones. I’ve used Burt’s Bees before but I don’t find them very moisturising (and I’ve tried them all). i do use lip balm everyday, esp under lipstick. maybe that explains why my lipstick doesnt stay. 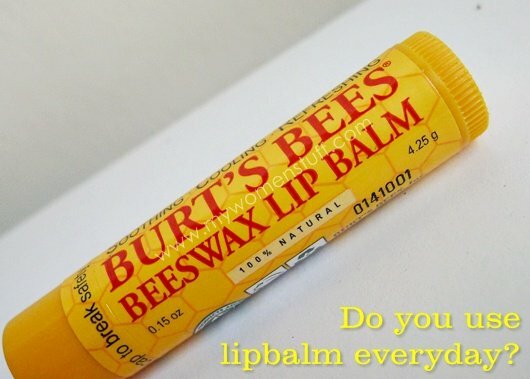 and yr pic reminds me that i have a brand new burts bee lip balm that i forgot to use! Haha… yes lipstick over lipbalm usually slides off quite quickly. My tip for that is to apply the lip balm, let it sink in and only after a few minutes, apply the lipstick. This way, the lipstick stays on longer. I apply it daily or my lips would get cracks and peeling! Can’t live without it. I’ve plenty of them but my everyday lipbalm s Vaseline Lip Essence Advanced 🙂 I’ve been using this brand for many years. I use lipbalm everyday and every night! Once I apply lipbalm, I do not have to apply lip color. I use Nivea Med Protection. Finish the whole tube every time! I love Dior lip color reviver balm although it does have the same prob that Paris encountered, too many layers become super fuchsia in colour. but I love the long-lasting effect and it brightens up my face when I dun put on makeup. I also want to share my new love: badger balm lip balm!! I love the vanilla one, and it’s the only one that makes my lips healthy and shining every morning I wake up 🙂 u can buy it on I-herb, the price is reasonable! I also love the jurlique love balm too, looks waxy but it melts under your finger’s heat… though I dun really like using my fingers to apply my lipbalm. 🙂 still prefers tube! Oh yeah! The dreaded side effect of dry lips/skin when on Roaccutane. Still, its helping your acne get better so that’s one plus point 🙂 This Dior Lip Colour Reviver Balm has me intrigued! You’re about the 3rd person to mention it? Hmm… 😉 I haven’t tried Badger but most of their products are quite nice. I’m not into lip balm coz’ it does nothing for me. Sometimes it makes my lips dryer than it should be. Lip gloss does the trick even better. If i have to choose one lip balm to love, it will be 100% Pure lip butters. Very yummy like real berry juice and oh…so glossy. hehe. I need lip balm everyday or my lips will become one flaky painful mess no matter what the weather. Sometimes it’s not even enough so I’ve taken to applying a more moisturizing one at night before bed. During the day I use LipIce Fruity (the one with SPF15) and at night, The Face Shop’s shea butter lip care. been using it everyday since my first day in university! The air-cond dries my lips and licking it would make it worse… I’d feel naked without it!! just as of lately, I’ve been using lipstick or lipgloss… gives me some colour cuz my mom says I look like a ghost! hahha.. too fair… no colour… plus, got free lippie from a friend in US! Sad that it melted on the way here 🙁 Any idea on how to make it good again ? I have 2 or 3 lip balms in my office drawer, one in every handbags (I only have 2 bags) and one beside my bed. Maybe I am a crazy lip balm addict. I keep one in my pouch that I used when I go for a walk. But I don’t have soft lips…why? Hmm… not sure of the answer to that 😛 Perhaps its the lipbalm you use? i have quite dry skin everywhere, and my lips are no exception. i use lipbalms quite a lot, i have one on my desk, one in my makeup storage unit, one in my handbag, one on my nightstand, and a lot of backups in the makeup storage. i use it probably 5-7 times a day tbh, first thing in the morning and last thing at night for sure and then some more during the day, i don’t wear makeup everyday, so lipbalm is the thing that keeps my lips moisturised. Goodness… with so many lipbalm fans here, I feel left out! LOL! Hmm… I’ve never come across Bepantol here so perhaps we don’t get it. But anything cheap that works well is always a winner in my book! I can’t live without lip balm! My lips are dry. I apply lip balm/lip care/ lip treatment every few hrs. I’ve tried many many lip balm. The best for me is still DHC lip creme. Nothing beats it. The down side is that it ran out pretty quick comparing to other lip care products. I can us Kiehl’s lip balm no. 1 for about 6 months per tube but for DHC I can only use it for a month or two max. I still love it though since the price is acceptable. oh, i try to … especially on days that my lips are dry because of the weather…. Every day? I apply it every hour! I’m so addicted. My favorite is the blue Chapstick, topped with lip gloss. i only used lipbalm actually, too lazy to put on lipstick or lip gloss! i’m hooked on to chopsaver lipbalm – there are two types – one with spf and the other without. found that it works best for my always chapped lips!